A "merry war" of witty banter with much duelling, dancing & kissing! Open air performances Saturday 7th and Sunday 8th July (3pm) at Putney Old Burial Ground. Shakespeare’s sparkling comedy, Much Ado About Nothing, will be Putney Theatre Company’s follow-up to their acclaimed production of A Midsummer Night’s Dream, which wowed audiences at the Royal Shakespeare Company’s Open Stages showcase. 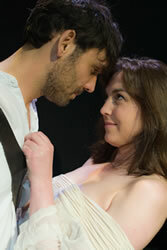 Much Ado About Nothing is famed for its “merry war” of witty banter between motor-mouthed lead characters Benedick and Beatrice, who were played on the West End stage last year by David Tennant and Catherine Tate and are portrayed in this production by Justin Stahley and Louisa Pead. PTC’s A Midsummer Night’s Dream was selected by the RSC’s Open Stages team to open its three-week celebration of amateur Shakespeare hosted by the Questors theatre, Ealing, in April. The showcase was the culmination of the London and South East regional element of the RSC’s ongoing Open Stages programme, which seeks to build stronger links and share skills between amateur and professional companies. PTC was described by a visiting RSC representative as an “excellent, enthusiastic” company. A Midsummer Night’s Dream, first staged at Putney Arts Theatre in June 2011, was “an excellent production, by far the best one I saw [as part of the Open Stages programme]. They made sense of the text and there were great performances throughout. It was also very funny." Much Ado About Nothing will seek to build on PTC’s developing style for performing Shakespeare: clear, fast-paced and with an emphasis on comedy. Like A Midsummer Night’s Dream the production will be staged at Putney Arts Theatre before transferring to the 18th century Putney Old Burial Ground for two summer afternoon open-air performances. Up to 200 people will be able to sit on blankets and deckchairs under the trees of the picturesque public park while eating picnics and enjoying the show.